It's nothing new, but the series' central charm returns to shore intact. It hasn’t been a pirate’s life for any of us landlubbers in many a year. Disney, apparently under the impression that this was a bad thing, has seen fit to end our shore leave with “Dead Men Tell No Tales.” The title is a lie, of course: Javier Bardem’s Captain Salazar is one of many undead seafarers in the film, most of whom can’t stop spouting off about maritime mythology. This latest voyage sets sail for the Trident of Poseidon, a mythical artifact with the power to break any and all curses of the sea. Newcomer Henry Turner (Brenton Thwaites) seeks to unbind his father (Orlando Bloom) from the submerged Flying Dutchman, where he’s forced to serve as captive captain; Salazar longs to return to the land of the living after being similarly confined to the purgatorial Devil’s Triangle; and, as ever, Captain Jack Sparrow (Johnny Depp) just wants to play one side against the other long enough to save his own skin and drown himself in rum. Guiding them all is Carina Smyth (Kaya Scodelario), a woman of science whose affinity for astronomy has led to her being branded a witch by the stuffy powers that be. “Kon-Tiki” directors Joachim Rønning and Espen Sandberg are at the helm this time around, proving capable captains even if the script they’re working from isn’t always seaworthy. Still, the film benefits from their nimble sensibility: We already knew from their comparatively low-key historical drama that they could navigate by starlight; here they show that they can also guide movie stars safely ashore. Depp, whom you may have forgotten received an Oscar nod for his first portrayal of the roguish swashbuckler, has so thoroughly committed every gesture and quirk to muscle memory by now that it can be difficult to tell whether he’s even trying anymore. That’s a testament to his skill, but also to the material’s familiarity — because 2003’s “Curse of the Black Pearl” was so genuinely good, the sense of a franchise having long since overstayed its welcome is especially pronounced in the “Pirates” world. Bardem picks up where the former “Deadwood” star left off, once again adding gravitas to the “Pirates” proceedings. 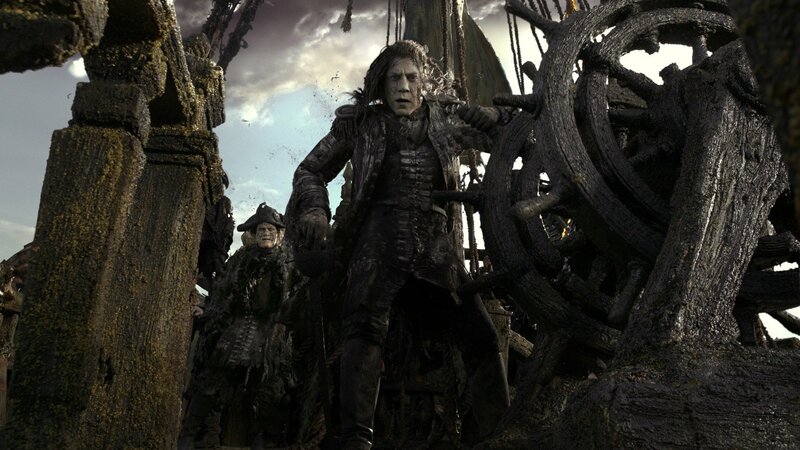 We learn via flashback that his Salazar was the first victim of a young Jack Sparrow’s cunning. The pirate-hunting Spaniard had made it his mission to rid the seas of anyone sailing under the black flag and was doing quite well until encountering that most famous of scalawags and being outsmarted by him; now, caught between life and death aboard the Sister Mary, he’s mostly reduced to oozing black oil from his mouth while whisper-shouting “…death!” to anyone who will listen. Bardem does his best with the material, but this capitán is no Chigurh. “Dead Men Tell No Tales” often feels like an attempt to give the franchise the “Force Awakens” treatment, with Thwaites and Scodelario serving as obvious analogues to Bloom and Knightley; Depp, though still the focal point, becomes something akin to their kooky uncle. Amid the usual overblown set-pieces, the co-directors find time for a few grace notes: a twinkling, rocky island that reflects the stars back at the heavens; a touching subplot centered on Geoffrey Rush’s reliably entertaining Captain Barbossa. Treasure comes in many forms here, and Rønning and Sandberg know which ones are worth pursuing. “Pirates of the Caribbean: Dead Men Tell No Tales” hits theaters on Friday, May 26.